Those who ventured over to Mill Valley’s downtown plaza this past Friday were treated to the sight of almost a fifth of the entire Mill Valley Middle School’s student population as they hunkered down with chalk pastels and blanketed the square with homages to artists ranging from Malaquias Montoya to Shepard Fairey to Emory Douglas. The brainchild of eighth grade art teacher Julie Leonard, the chalk art event is the fourth of its kind to be held downtown on the square in the past five years. Art, one of the electives students can choose to take at MVMS, is funded by Kiddo! and the MVMS Parent, Teacher, Student Association. The event, it should be noted, is a sea change from the the field trips Leonard used to take her classes on to hear talks at the Kabuki Theater produced by the San Francisco Film Society. Leonard’s solution was brilliant. 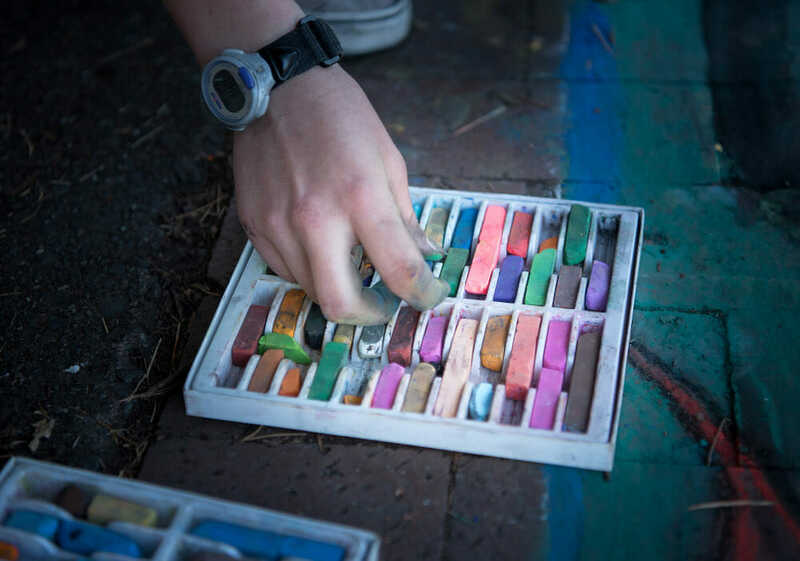 Since part of the eighth grade curriculum involves protest art and public art, she wrote an application the summer prior to the inaugural chalk art event and filed it with the Mill Valley Park and Recreation Department. With a deference to the changing sensibilities of a more modern Mill Valley – a city that was once a cauldron of hippiedom and peaceful protests – Leonard shied away from protest art in her request for permission and instead said her students’ projects would focus on artists that somehow had roots or connections to California. This past Friday was no exception. With a list of 30 artists to choose from (and more, if the students could prove the artist they preferred to emulate had some sort of California connection), the MVMS art students broke off in teams and set to work echoing the works of Wayne Thiebaud (famous for depicting cakes, lipsticks and bubblegum machines) and the aforementioned Douglas (a graphic artist who worked as the Minister of Culture for the Black Panther Party from 1967 through the ‘80s) and Fairey (an artist most popular for his Barack Obama “Hope” image, and, more recently, the image of Munira Ahmed, a Bangladeshi American and Muslim woman, wearing an American flag hijab). Whether the art had a political edginess or not, Leonard says it all comes down to the fundamentals. But on Friday, as in years past, it didn’t take long for the students to overcome the practical obstacles and to start creating art in their own right. Read more about art teacher Julie Leonard here. Art education in Mill Valley public schools, from transitional kindergarten to eighth grade, is funded by donations to Kiddo!, whose 2017-18 campaign kicked off on May 4.